After some dissertation, I am once again back and will soon be able to get back to my regular posting schedule. Lots has been happening the past few months where I was mainly focusing a lot towards my growth in my work. Now that it has finally slowed down a little, I could breathe with ease and I feel like floating in the air too...dancing to every single upbeat Christmas song I hear and my personal favourite has to be the Jazz-Blues, Traditional Pop genre. I grew up listening to wonderful singers like Frank Sinatra, Barry Manilow, just to name a few. However, I do have a current personal favourite too. I have been hooked to this wonderful singer ever since his first album. Perhaps it comes as no surprise to my friends, that at this time of the year, I will be caught humming and tapping to the tune of Winter Wonderland, listening to the smooth-silky voice of Michael Bublé. Since I'm in the mood for the holidays, let me present to you my all time favourite nutty PECAN PIE with SALTED CARAMEL is a classic. There may not be a lot of people around me know, that I have a soft spot for them. Just a slice of this luxuriously crunchy, caramelized aroma and taste pie is enough to make your knees wobble. Pronounced either as "pee-CAN" or by some as pee-KAHN", this is one Classic Pie that is perfect for the holidays. So start cranking up the oven peeps! After several attempts over the week, I am finally back up posting. This post had me excited and I desperately wanted to share it with you so badly. Have you ever been excited about something that you wish you could share it in an instant? I suppose luck isn't at my side as I kept having network issue. Oh! the agony. Moving along, this is somewhat out of my comfort zone, and certainly well worth the effort. French Crepes are pancakes too, and in a much thinner and lighter form. Lately, there has been a craze here in Asia and possibly this originate either from the French or the Japanese or maybe a fusion of both. Anyhow, where it came from now has certainly driven me to further dig up the roots as they have come up with something so brilliant, transforming these light crepes into cakes. Layers and layers of french crepe, slathered with custard cream and topped with jam, glaze, or as simple as powdered sugar makes this my new found love for cakes. 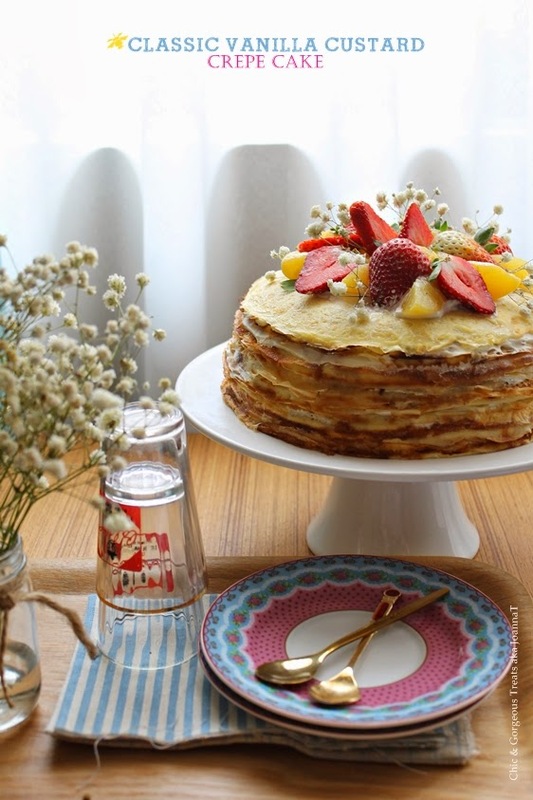 To start, and to many more to come, I am starting off with the basic classic love for VANILLA CUSTARD CREPE CAKE.